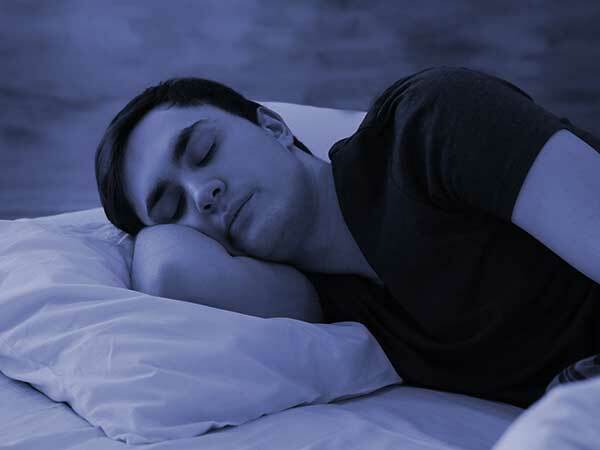 The NightWave Sleep Assistant was created for the millions of people who suffer from insomnia, middle-of-the-night awakenings and for people who just have trouble falling asleep. Unlike drugs or herbal remedies, there are no side effects other than a good night’s sleep. Bright artificial lights such as those emitted by a TV screen interfere with the body’s production of melatonin. Darkness normally stimulates the secretion of melatonin, which causes drowsiness. Noise from the street or a snoring sleeping partner can be difficult to ignore. In middle-of-the-night insomnia, it is often a noise that initially wakes the person up. Then they have trouble falling back to sleep. Flying from coast to coast is not something the human body is equipped to handle. People have various ways of dealing with jet lag, many of which cause drowsiness or a hung-over feeling the next day. Jet lag is caused by an interruption of the circadian rhythm, something you might think of as your body’s internal clock. The Night Wave Sleep Assistant can be used to help reset the clock naturally. Stress seems to accompany modern life. Busy schedules and lots of responsibilities make it difficult to relax. Stress causes the body to produce more cortisol. Cortisol works against melatonin and prevents it from being produced in response to darkness. One of the over-the-counter remedies for insomnia is melatonin. The melatonin dietary supplements are derived from the pineal glands of animals. There is a risk of contamination and disease transmission. It can cause the same adverse reactions accompanying prescription sleep aids. Those include excessive daytime drowsiness. Melatonin is not safe for everyone and does not work for everyone. It is completely ineffective for middle-of-the-night insomnia. On the other hand, NightWave is safe for everyone. It is an effective relaxation technique that makes use of deep breathing. Deep breathing exercises are known to be effective for relieving stress and anxiety. Even people who have received training in deep breathing exercises often have trouble quieting their minds long enough to focus on the breath. The Night Wave device emits a soft blue light. The luminance of the light slowly rises and falls. You learn to synchronize your breathing with the rise and fall of the light. The light shuts off automatically after a time. You may fall asleep before that happens. Focusing on the light allows you to escape the buzzing thoughts responsible for keeping you awake. It is almost hypnotic. If you wake in the middle of the night, you can reset the device and get back to sleep. The light will not disturb your sleep partner. Next day drowsiness will not be a problem, because you slept well without the use of sleep aids. Night Wave is a better alternative than white noise machines for several reasons. First, the machines only work to block out other distracting noises. In some cases, being awakened by a noise is a good thing. A crying baby or the sounds of the alarm clock are examples of noises that should wake you up. A white noise machine may prevent you from waking when you need to, while interfering with your bed partner’s ability to get to sleep. The NightWave Company also provides stress reduction software for Windows and Mac computers. The training provided by the software helps to reduce your stress level during the day, which makes it easier to get to sleep at night. Overall, the NightWave Sleep Assistant is one of the best alternatives for getting a good night’s sleep. It’s safe, convenient, effective and affordable. Get the Original Nightwave Sleep Assistant at Amazon here.